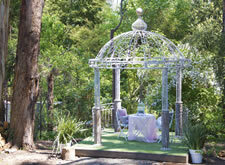 If you are looking for a unique location for your intimate celebration than Dreamcatching is the place for you. 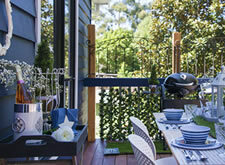 As your consummate host, Julie will put all the finishing touches together to ensure there is no detail left out. Celebrating at Dreamcatching will give you the opportunity to create the event of your dreams down to every last teeny tiny detail. Your heart will sing, and your guests will feel loved and welcome. The memories that you create will last a lifetime. We pride ourselves in creating your very special intimate wedding or elopement occasion with everything at your fingertips. Let us spoil you while all you have to dream about is how perfect it will be with your perfect partner. As you stand under the ornate gazebo in the backyard you will remember how and why you fell in love with that special someone. The only noises you can here are the birds in the trees singing and the creek happily rippling in the background - the perfect way to say "I do". If you want to spend the last night with your girlfriends before you get married, then Dreamcatching is the perfect place to spend giggling and laughing with your closest friends. 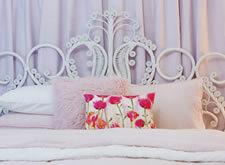 The home is the ideal girly hideaway to host a fun night of celebration. We can organize a high tea treat, flower crown workshop, pick up bike tour adventure on the trail or try an 80's dress up disco aerobic class in house with the energetic "Nikky No Stopper"!! (Blast guaranteed). The home is perfect to host your bridal party before your big day. 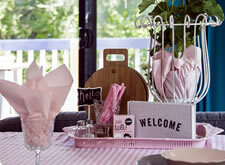 The bride and bridesmaids can enjoy a relaxed girly night with fun and laughter. Or the groom and his groomsmen can share a drink and chat to calm the nerves before the big day. What great memories you will create! Wake up on the big day and organise for some amazing photos inside and outside the home. It really is the most splendid way to start your dream wedding day! Does your little one want a sleep over with some of their closest friends for their birthday, but you don’t have the space at home? Whether it's a small group of girls or boys, we can cater to your needs. Imagine an Alice in Wonderland home full of fun and enchantment. 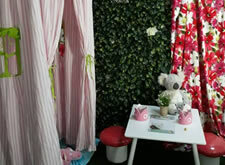 Julie will create so many fun activities, surprises and excitement throughout the house for your mini guests. The delight on the faces of your little ones will say it all. We can cater a mini high tea package if desired. Rent Dreamcatching for the sleep over party of the year. 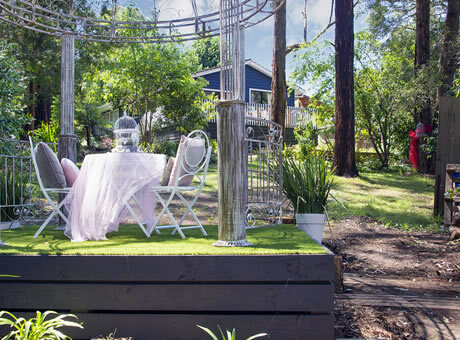 Imagine hosting a diminutive birthday celebration at Dreamcatching with you and your closest friends and family, you will enjoy love and laughter in the privacy of a backyard where the only uninvited guest are the birds in the trees. Celebrating at Dreamcatching will create the most amazing memories of love and joy. With fairy lights hanging in the trees and the gazebo glittereing, it's a perfect setting to enjoy your guests with no stress or interruption.